I know most of you have already worked this out but I can officially confirm... there are only so many hours in the day. How have I come across this insight? Well, I've just started a masters degree and - as my absence from blogland suggested - have been struggling to get everything done. On the upside, neglecting Postcardese has allowed me to achieve all the essentials of student life; a handsome amount of stationery has been procured, my face is suitably unshaven and - while not yet perfect - my I-was-just-about-to-say-that nod is coming along well in classes. The course is art and politics. And over the coming year, I'm going to try to think through how some of the concepts I'm picking up relate to postcard messages. The end goal? Well the main reason for doing the course is to enjoy having a think about stuff, but on top of that some postcard-related art is going to emerge. It would be great if people could fire up their imaginations on what this might look like. Or if there's some event, artist, thinker that is relevant, send me a link to postcardese@gmail.com. First up is an idea which has come up a couple of times in class - Jeremy Bentham's Panopticon. Bentham designed this theoretical prison as a way to demonstrate the power of surveillance. He wanted to explore how isolating and watching prisoners might change their behaviour. In the Panopticon, inmates were to be kept in cells around the edge of a circular prison - they'd be visible at all times to a guard in the centre of the building. Cells were to be backlit and the guard's hut would have no light, meaning he could see prisoners at all times but the prisoners did not know when the guard was there. Prisoners would, Bentham thought, be conditioned by surveillance into changing their behaviour. Or as he put it, surveillance would "grind rogues honest." The Panopticon never got built in England but you only have to think of today's CCTV cameras to appreciate how the power of surveillance has become a very real mechanism of power in modern society. 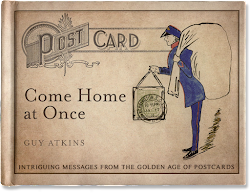 The open nature of postcards means the sender accepts their message may be read by others besides the addressee. There is a parallel between the prison guard sometimes being in their hut and the postman sometimes passing the time by thumbing through cards as he/she delivers them. The question we are left with is how this surveillance changed the behaviour of our Edwardian postcarders. Worth pondering. If you have any ideas or comments please put them up on the boards. Finally, rather than just giving you still images this week, I've uploaded a video which discusses a message affected by the prospect of snooping postmen. Ignore any camera wobble - it's deliberate ;).